If you’re looking for a career that leaves you feeling fulfilled knowing you helped someone, you’ve come to the right place. As a caregiver with Alamo Companion Services, you have the opportunity to help a senior continue to remain in the home environment they choose. Our team of care providers makes a difference in the lives of the clients they work with and their families. Our caregivers perform a variety of services including personal care assistance, medication reminders, meal assistance and more. We are always looking for compassionate and caring people to join our team. 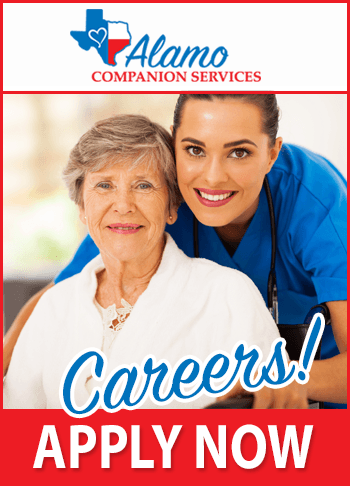 If you’re interested in becoming a care provider, we would love to talk to you about a career with Alamo Companion Services. Thank you for your interest in Alamo Companion Services.